Germany has completed repatriation of 300 tons of gold bars from the United States. According to Russian economist Vladimir Katasonov, initially the American side was not ready to give the bullion back, but finally came up with a plan. Germany’s central bank has established the return of its gold reserves to domestic vaults by the end of 2017, three years ahead of schedule. Earlier this week, the Associated Press reported that the Bundesbank had completed relocation of 300 tons of gold from the Federal Reserve Bank of New York. "The transfers were carried out without any disruptions or irregularities," Carl-Ludwig Thiele, a member of the Bundesbank’s Executive Board, was quoted as saying by Bloomberg. 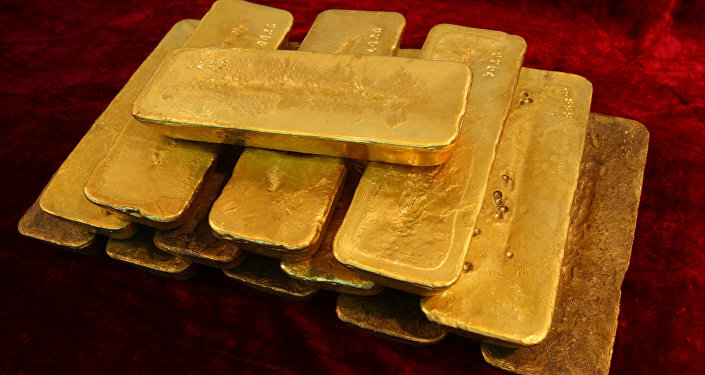 According to the bank, 111 tons of gold were repatriated from the US in 2013. It also returned 105 tons from Paris. According to data from Marketwatch, by the end of 2016 47.9 percent of Germany’s gold reserves had already been stashed in vaults in Frankfurt, with 36.6 percent remaining in New York, 12.8 percent at the Bank of England in London and 2.7 percent at the Banque de France in Paris. In January 2013 Berlin announced that it was planning to store half of Germany's 3,378 tons of gold reserves in its own vaults, with the other half remaining in New York and London. According to the original plan, the Bundesbank would transfer 300 tons of the precious metal from New York and 374 tons from Paris to a facility in Frankfurt by 2020. Valentin Katasonov, a professor at the International Finance Department at the Moscow State Institute of International Relations (MGIMO), suggested that the US disposed of Germany’s gold bars at its own discretion. "There are a lot of signs that the gold was not physically presented in the New York vaults when Germany called it back. Of course, the US began to return it to Germany but there is one interesting detail. When you leave your suitcase in the luggage storage you expect to get back the same suitcase. But Germany took the wrong 'suitcase,'" Katasonov told Radio Sputnik. According to the economist, the gold bars that Bundesbank repatriated have different labels. He suggested that the US might have replaced the German bullion with different gold bars bought from the market. Katasonov explained that the US managed to return the yellow metal thanks to favorable conditions in the precious metal market. "I think there was a favorable environment in the market and the Americans managed to quickly buy the gold and give it back to Germany. They were not ready for this, but finally managed this replacement," he concluded.